One of the largest retail banks in the North America sought to improve customer satisfaction in the call center by eliminating time- consuming processes. Limited by a nonspeech-enabled IVR, the bank was constrained to outdated authentication options, such as PIN numbers and knowledge-based authentication (KBA) questions. Long enrollment processes and authentication challenges were driving call handle times up, causing significant customer frustration. The bank turned to Pindrop for help. 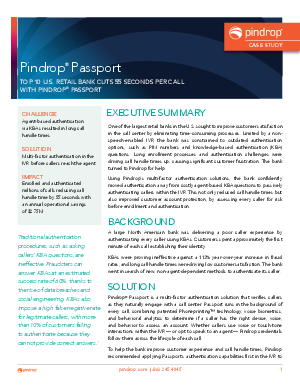 Using Pindrop’s multi-factor authentication solutions, the bank confidently moved authentication away from costly agent-based KBA questions to passively authenticating callers within the IVR. This not only reduced call handle times but also improved customer account protection, by assessing every caller for risk before enrollment and authentication.